Want to fast-track your online business? Try buying one that already exists. Facebook's recent $1 billion acquisition of Instagram, the $200 million forked out by Zynga to acquire Draw Something maker OMGPOP, and Twitter's purchase of Posterous.com shows the level of activity in buying online businesses right now -- especially when it comes to those with a strong and loyal audience. Even for more modest acquisitions, buying an established online business, rather than starting one from scratch, gives the new owner a number of advantages -- not least of which include: instant customers, traffic and revenues. Just ask serial business investor, Adam Radly, who recently found himself enamored with the idea of getting into web-media services. After considering starting up his own shop, the Los Angeles, Calif.-based entrepreneur says that idea quickly vanished once he found Flippa.com, a website marketplace. For $140,000, Radly in 2011 purchased CreativeLogicMedia.com, a custom web development site with a strong client base. Similarly, the entrepreneurial father-and-son duo, Randall and Matt Caldwell from Philadelphia used Flippa to find PitchingMachinesNow.com, a site that fit the pair's criteria -- which included cash flow, price-to-earnings ratios, profit margins, search rank and scalability. In 2011, they spent $149,000 on the online baseball equipment retailer, which had almost 10,000 unique visitors each month. Based on your desired business and industry, consider the following two options: Canvas the web for sites that match your criteria and contact the owners in hope of a sale. Or, you could search for companies on online business marketplaces. Should you choose door No. 1, you may be forced to do some serious legwork. An analogous situation is buying a house by going door-to-door in your desired neighborhood. One time-saving strategy is to search for abandoned sites by including terms like "Copyright 2009 + [your keyword]" or "copyright © 2009 + [your keyword]" in your search query. All sites should have copyright notices which are usually located at the bottom of the site. If you search for a site that has an old copyright, it could mean two things: either you found an abandoned site or the site owner hasn't updated the site's copyright. If you get lucky and find an abandoned site -- like we have in the past -- then it's time to start negotiating a deal. Be sure to consider a company's social-media exposure too. Like Radly and the Caldwells, you might also visit website marketplaces like Flippa, Digital Point or WebsiteBroker.com. These sites allow you to compare and contrast sites based on different criteria such as revenue, traffic, age and niche. The charges can include a listing fee, a percentage of the sale price or a combination of the two. 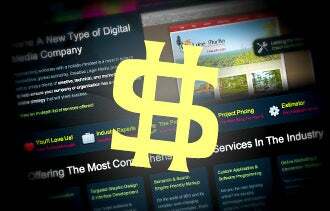 An important consideration during your search is the pricing of a potential web investment. According to Justin Gilchrist, a Manchester, England-based industry consultant and founder of FlipFilter.com, a website sales analysis tool, website buyers are typically paying between 12 and 24 months revenue. You can usually expect to pay between $100,000 and $200,000 for an online business that is generating $100,000 in annual revenue. Once you've spotted a few sites in your price range, you'll need to verify a seller's claims. Most website marketplaces will provide free tools to help you through this process. But you will need to work with the seller to verify their claims regarding particulars like financials and traffic data. Screenshots can be doctored, so they shouldn't be considered alone as proof of financials or traffic. Instead, try to arrange a time to do a screen share with the seller so that she can walk you through her site analytics and accounting systems. This can be done through tools such as Skype, Join.me, Screenleap or even through Google+ Hangouts. Even better? Some sellers will be able to provide audited accounting records. Once you've agreed to a sale price, you'll need to put together a website-sales agreement that outlines the buyer's and seller's obligations. In high-value transactions, a good agreement will include a seller's promise to perform consulting services as well as any noncompete clauses. The extent to which you use formal legal services for this agreement, or templates such as those provided by website marketplaces, will naturally depend on the size and complexity of the transaction. But clarity is always key, says Zak Muscovitch, an intellectual property attorney in Toronto. "The most important considerations in choosing the type and source of a legal agreement… are whether it reflects the parties' intentions and is understood by the parties to the transaction."